Rounding off his series on snipers, Leigh Neville, author of Modern Snipers, looks at how sniping techniques and technology have changed over the years. Although the core attributes of the sniper remain unchanged since the Second World War- physical and mental endurance along with exacting patience paired with some outstanding marksmanship and fieldcraft- the tools and techniques of the sniper have seen a revolution. This revolution is largely a direct result of the war on terror that has waged in Iraq, Afghanistan, Syria, Libya and elsewhere since 2001. Indeed the sniper has found himself to be in greater demand today than at any time since the 1940s. The sniper rifle has changed markedly since the Second World War. It has, like most infantry small arms, become lighter, more accurate and more durable. Semi-automatic sniper rifles have entered widespread use overcoming the reliability problems of the early German G41, G43 and Soviet SVT-40. In fact, today’s sniper is probably just as likely to be using a semi-auto as a traditional bolt-action. As we’ve discussed in earlier blog posts in this series, the semi-auto offers a number of advantages for the modern sniper, particularly in urban environments. The calibre of the issue sniper rifle has also increased with many units adopting .300 Winchester Magnum or increasingly the .338 Lapua Magnum as their standard sniping calibre. The larger calibres of course offer greater lethality but, equally importantly, greater range and velocity. In the early 2000s, snipers in Afghanistan found that they were engaging targets that were at the extreme edge of the envelope for their 7.62x51mm sniper rifles. Many armies began replacing or supplementing these with .300, .338 or .50 sniping platforms. The rifles themselves have now been made lighter with the use of polymers and skeletonised stocks. They are also now typically fitted with sound suppressors, infra-red lasers and integral bipods, all of which make the rifle more accurate and the sniper harder to locate, particularly at night or form a camouflaged hide. Many rifles even feature swing-out thermal imaging attachments that work with the rifle’s scope to display the thermal profile of a target in any light conditions. A U.S. Marine receives instruction on the SVD, which features a skeletonized thumbhole stock. The humble telescopic scope itself has also advanced tremendously. Today’s sniper optics bear little resemblance to their Second World War predecessors. Scopes now feature bullet drop compensators that make allowances for the drop of the bullet at various ranges, the Horus reticle allows much faster shot corrections, and many optics now feature co-located mini red dot sights to allow the sniper to use his rifle at close quarters should he be forced to clear a building or is suddenly ambushed. The scopes are also typically armoured in construction to defeat the effects of blast or blow. Developments in ammunition design have seen new bullet types emerge that are so-called barrier blind meaning they can defeat intervening objects in the path of the sniper’s round and continue on to strike the target. Other rounds like the Raufoss Mk211 have been designed to penetrate light armoured vehicles using a tungsten penetrator before an explosive incendiary detonates inside. Not surprisingly these are devastating on human targets. Other specialist rounds like solid copper alloy bullets have even been developed to defeat even reinforced glass with minimal deflection. The other great technological revolution has been in the field of ballistic computer programmes and apps. Many of these were initially Blackberry based but are now available for the ubiquitous iPhone and iPad. The best of these will calculate a firing solution taking into account spin drift, wind (snipers routinely carry the likes of the Kestrel wind meter to measure the effects of wind at his final firing point), barometric pressure and temperature, and even Coriolis drift- the gravitational effect of the rotation of the Earth on the sniper’s bullet. Although widely employed, snipers are careful to know the limitations of such devices. Former Sniper Master for the Australian Army, Company Sergeant Major Nathan Vinson, confirmed this to the author; “This only calculates factors from the shooter’s end, not at the target end. It increases your chances of getting a first round hit but doesn’t guarantee it.” Even with the latest ballistic app, the sniper still needs to be able to read crosswinds that will affect the path of his round and factor in the movement of the target itself. 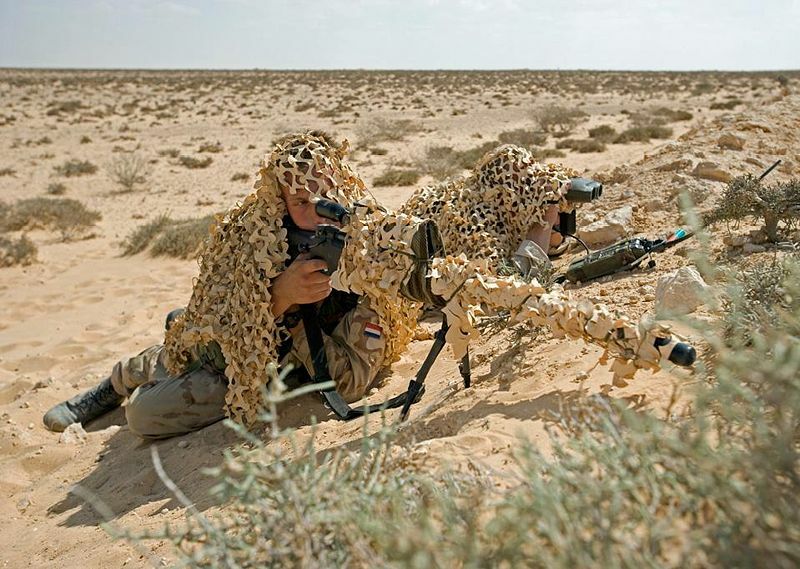 A Dutch ISAF sniper team with VECTOR IV Leica/Vectronix laser rangefinder binoculars. Judging the range to the target however has become as simple as pressing a button. Today’s laser range finders have in-built GPS receivers so the exact range to the target, and the GPS grid of that target, can be recorded. Increasingly this data can be uploaded into Blue Force Tracker and similar battlespace management systems to show the location of enemy units, allowing a commander to have the very latest picture of enemy dispositions. It can also be uploaded through Rover terminals used by forward observers and air controllers to guide in indirect fire missions or air strikes. Many of the techniques and tactics used by today’s snipers cannot be discussed for operational security reasons but several areas of innovation can be touched upon. Huge leaps have been made in high altitude and high angle shooting for instance, with specialist courses teaching the impact of altitude and pressure on ballistics and the use of the angle cosine indicator that helps correct for the increased bullet drop. More than a decade of combat in the mountains of eastern Afghanistan has taught the sniping community the importance of training for operating at altitude. Snipers are also now as highly skilled in reconnaissance techniques as they are in marksmanship- many snipers argue that their primary role is now to serve as the eyes and ears of the battlespace commander. They are trained in the use of all manner of digital cameras and active and passive surveillance technologies along with burst transmission satellite radios, allowing them to upload imagery and situation reports covertly from their hide site. The sniper can provide detail that no drone can. We’ve touched upon aerial interdiction in an earlier blog but it is worth mentioning as a technique that really saw its evolution during the war on terror. Snipers were increasingly used to disable insurgent or terrorist vehicles with precision fire, offering a chance of capture and effectively negating the collateral damage that may be caused should a Hellfire missile or bomb be deployed against the target. Snipers have also been used to interdict terrorist suicide bombers in explosive laden cars or trucks known as VBIEDs (Vehicle Borne IED). Coalition special operations snipers are even today eliminating Islamic State suicide VBIEDs with precision fire in Iraq and Syria. 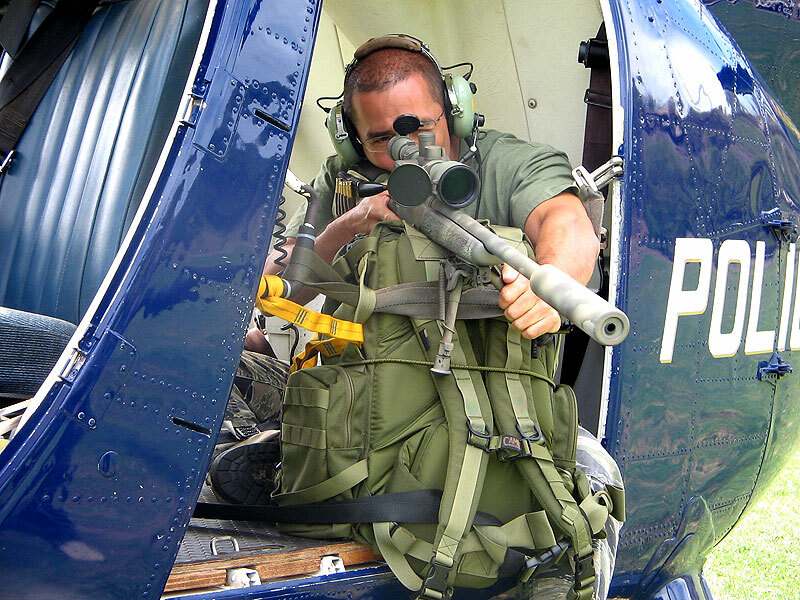 Honolulu Police Department Specialized Services Division Counter-Sniper Team conducting aerial platform training. What does the future hold in terms of sniping technologies? The rifles themselves will continue to become lighter and more compact. They will also be increasingly modular allowing a sniper a choice of calibres and barrel lengths dependent upon the tactical requirement. Many believe we will also see an increased use of so-called smart or guided rounds. These may take the form of semi-intelligent projectiles that are either guided through a scope, much in the manner of an ATGM, or that lock-on to a target and react to target movement. Along with a number of classified efforts, the commercial TrackingPoint system shows promise. TrackingPoint will calculate the optimal firing solution and will only fire when those conditions offering a high probability of a hit are met. Other developments will be in the field of camouflage. Although the legendary Ghillie suit is still widely used, today’s versions typically mask the sniper’s infra-red signature, and in some cases reduces his thermal signature making him much harder to detect should the enemy be using night vision technology. Currently being trialled is the next generation of that system-active camouflage that mimics its surroundings in Chameleon like fashion. Tom Clancy’s Ghost Recon finally meets reality! For more reading on the role of snipers in modern warfare pick up a copy of Leigh Neville’s Modern Snipers, now available on our online store.